It is very easy to enable Adobe Flash Player in Google Chrome, Firefox, Internet Explorer, Opera browsers on Windows 8 | 7. Please review the section relevant to the browser you are using. First of all, ensure that you have indeed downloaded Adobe Flash and installed it properly on your Windows computer and updated it to its latest version. 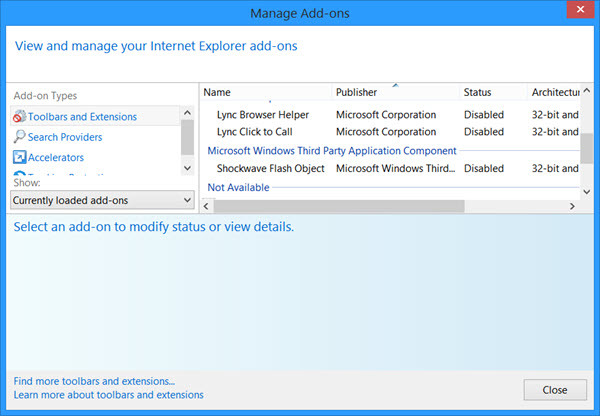 If you are using Internet Explorer on Windows 8, then Flash has been integrated and its updates are offered automatically by Windows Update. Others should ensure that their Flash Player is always up-to-date, as Adobe frequently needs to release updates to patches vulnerabilities in it. Make sure that you have configured Adobe Flash Settings, just the way you want them to be. Here, ensure that Shockwave Flash Object is Enabled. Flash Player is also referred to as the Shockwave Flash Object. Check this post if your Flash Player is not working in Internet Explorer. 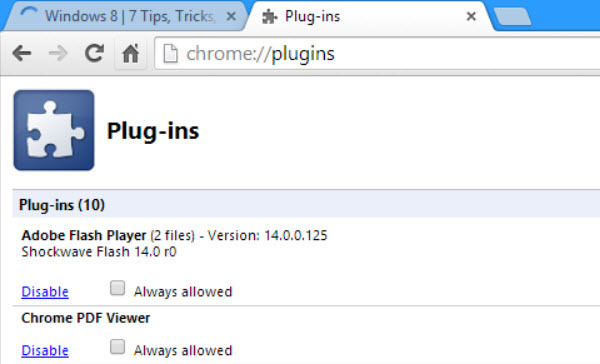 Open your Google Chrome browser, type chrome://plugins in the address bar and press Enter. Scroll down to Plugins. Here you can select Disable, Enable Adobe Flash Player and also check the Always allowed check-box, if you wish. From your Mozilla Firefox menu, select Addons. Open Opera Menu. First click on More Tools > Enable Developers Tools. Now open the Menu again. You will see Developers Tools enabled. click on Developers Tools > Plug-ins. Here you can enable or disable the Adobe Flash Player, as you feel.